Depending on the insulation quality of the house and the height of the flow temperature, a wall heating system needs between 20% and 35% of the living space. However, this is not the only difference to underfloor heating, which generally requires one hundred percent of the living space. Underfloor heating systems react more slowly to climate changes, require higher flow temperatures and cause dust swirling. As a result of the smaller area requirement, the client saves installation material for wall heating systems, thus lowering the production costs. 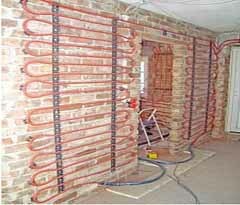 Wall heaters radiate radiant heat and can be combined with clay or lime. You will find several reasons to deal with this technique in more detail. This entry was posted in heating, indoor climate and tagged wall heating systems on 2016/12/02 by joachim-w.